Baby, it’s cold outside. And there’s nothing like the comforting and warm taste of hot chocolate to warm us from the chill in the air. Combined with the cool and refreshing taste of mint, this mint hot chocolate recipe is the perfect winter treat. 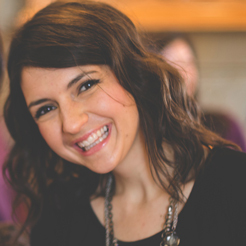 It can be a great hostess gift too. Just because it’s cold outside, it doesn’t mean you can’t give or grow herbs. 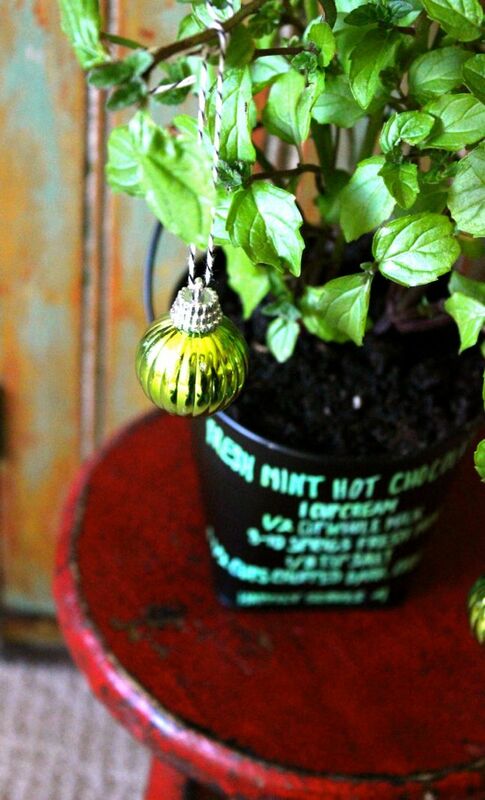 With some sun, water, and a little love, mint can grow indoors. So, as the calendar fills up with holiday parties and the need for a cute hostess gift arises, with a few simple steps you can give the host/hostess a potted mint plant, along with a delicious recipe for homemade mint hot chocolate. Step 1: Plant the mint with the potting soil in the chalkboard pot. 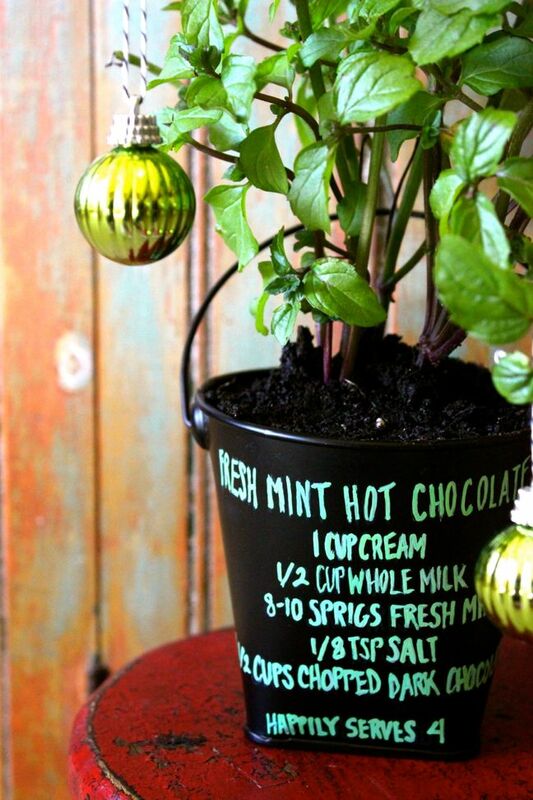 Step 2: With a chalk pen or chalk, add a mint hot chocolate recipe to the pot. If you don’t have a recipe, add a recipe from another favorite hostess like Martha Stewart. Step 3: To make it festive, you can add an ornament or two. It may look slightly like the droopy Charlie Brown Christmas tree, but who doesn’t love a little piece of Charlie Brown Christmas in their home? Keep the mint plant watered. Make sure it’s in a location where it will receive good morning light, and some shade in the afternoon. To extend the growing season, pinch off flowering buds frequently, or cut as you need them. 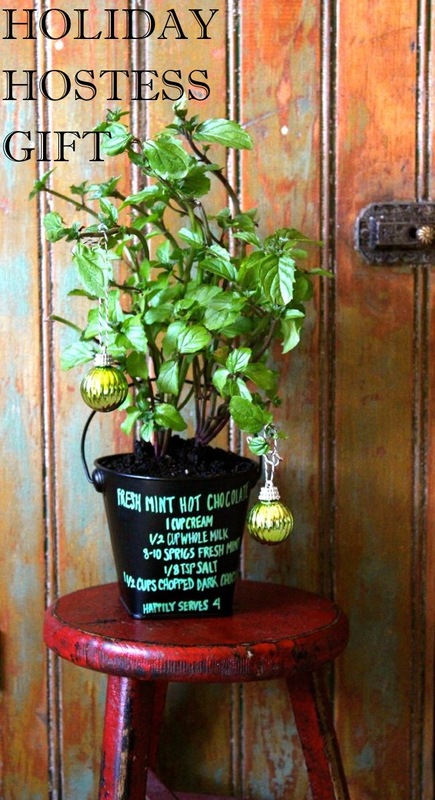 You are mint to give this hostess gift this holiday season! Happy Holidays!